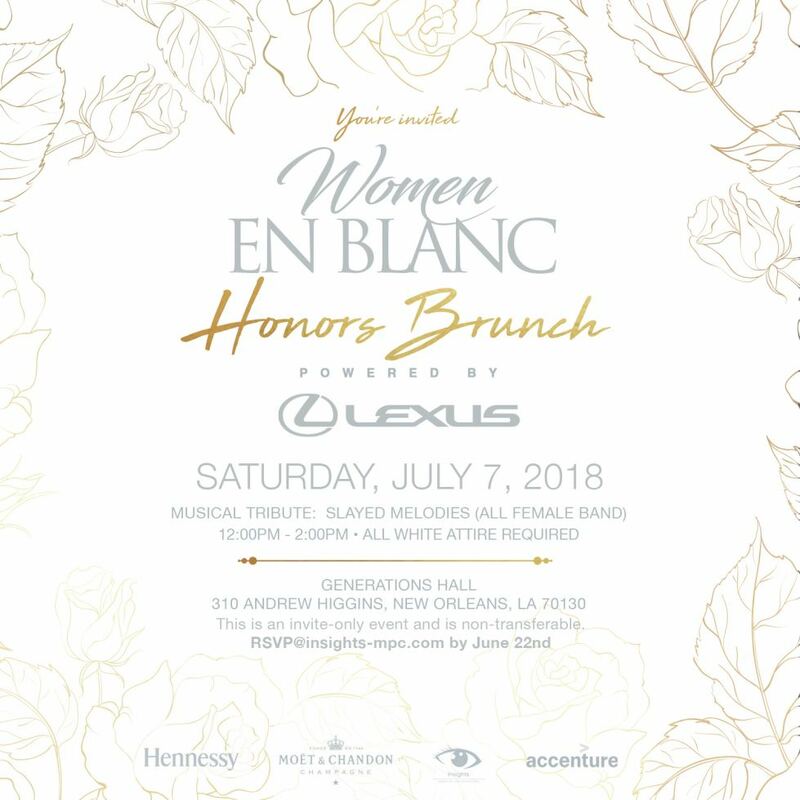 NEW ORLEANS - June 21, 2018 - PRLog -- On Saturday, July 7, 2018, Insights Marketing and Keshia Walker will host the annual 'Women en Blanc' Honors Brunch - an invitation-only, all-white brunch experience to celebrate phenomenal change agents in the areas of business, media, entertainment, sports, community, civics, politics and technology. Presented by Lexus, Women en Blanc will honor this outstanding group of women during the country's wildly popular Music Festival at Generations Hall (310 Andrew Higgins Blvd, New Orleans, LA 70130) from 12p - 2p. Invited guests and honorees will enjoy a luxurious afternoon featuring a delectable brunch experience and spirits courtesy of Hennessy and Moet & Chandon. Confirmed guests include actress Kym Whitley, singer LeToya Luckett, and hip-hop legend Yo Yo. "Celebrating our 20th anniversary is a major milestone, and our team is excited to bring together this phenomenal group of women to honor their achievements at the inaugural honors brunch in the culture-filled city of New Orleans," says Keshia Walker, President of Insights Marketing. "We are thrilled to celebrate such an amazing group of women who have served as trailblazers in each of their respective industries," says Alva Adams-Mason, Director of African American Business Strategy, Corporate Communications at Toyota USA. "Similar to the Lexus brand, their unwavering commitment to positive advancement, innovation and performance has, and continues, to empower the lives of people all over the world. That is certainly to be honored," she continues. Special thank you to Women en Blanc partners Walmart (Table Partner) and our vegan beauty brand partner Shedavi, featuring their all new CROWNED Collection and their signature white cosmetic bags for all attendees. For more information about the Women en Blanc Honors Brunch, visit www.insights-mpc.com. With over 20 years of marketing experience, Atlanta-based agency Insights Marketing, paves the path for innovative events in Sports Marketing avenues. Insights has created and executed events all around the country specifically during notable events such as NFL Super Bowls, NBA All Star Weekends, the Kentucky Derby, Essence Music Festival and a myriad of other highly attended events. Specializing in corporate sports marketing, promotions and special events catered to the urban and professional consumer segments, Insights boasts marketing managers in 28 cities throughout the United States. Creative strategy, strong client – agency relationships, and a desire for the client to succeed are at the heart of what drives our team to produce stellar events time after time.